Sieving through a dense layer of transport, haphazard and junky on a hard road we are in a small town placed between the clarity of an established city and that of an even clearer village… headed towards the latter. 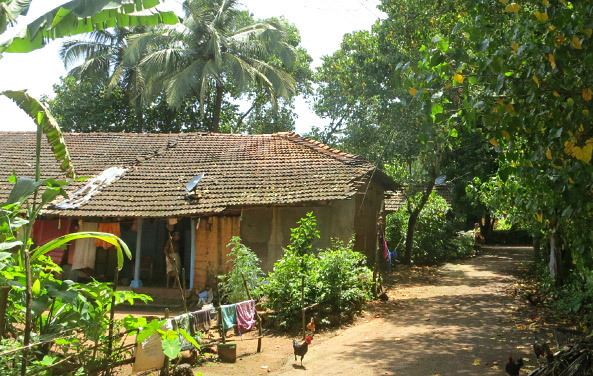 Cool breeze, soft padded mud beneath our wheels, dense foliage, we are already in Paliem, a small settlement of Konkani weaver families placed in time that went by as giant old trees, leading us to Baburao Thilvey’s humble but inviting abode. This old but hardy man is now partially deff, he has served more than his best as a weaver and let the religious tattering of the shuttle take away from him whatever it asked for in order to give him yardages of Kunbi…. and he holds it as Neivediam in his hands. Kunbi is derived from kun and bi meaning “people” and “seeds”, respectively. Fused together, the two terms mean “those who germinate more seeds from one seed”. The fabric meant for farmland laborers mainly is their identity. 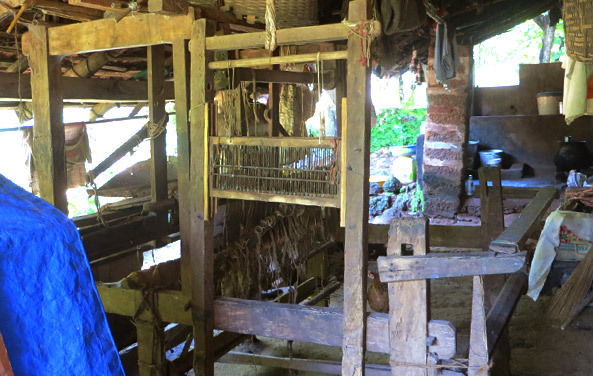 A weaver for fishermen he was… and was celebrated in the community once upon a time. 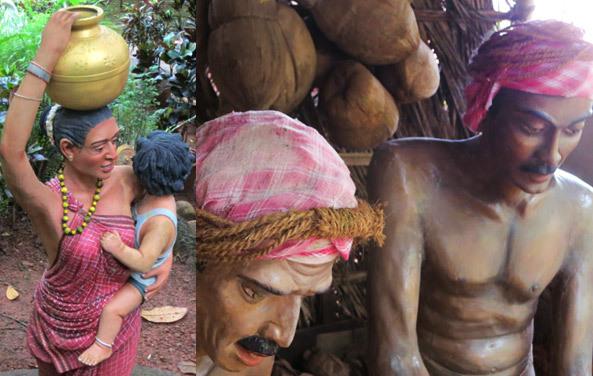 Goa under the Portuguese rule used to be a hub for handloom weaving and many weavers had flourishing workshops that produced Kunbi sarees and kashtis. When Goa became a part of India power looms came into being and later handlooms were sold for fire wood and weavers had to choose other occupations due to decline in the market demand. While the demonstrations died with the death of looms, the celebrations were kept alive and can be heard even now when this old man talks about his work. The authority to talk on Kunbi weaves with deepest reverence and accuracy can never go to anyone else…. Even if the only language he knows is a variant of Konkani and the audience has no clue about it. Baburao and his first daughter in law host us in their once mud but now cemented porch, under the Kavelu shed. A little window opening in the porch is left open and we are offered drinks from this family run village grocery shop. Just adjacent to this is a semi open court with a shed sheltering machines of the bygone era… their function has ceased but the place is still intact. Leading us to the good old times, when business was flourishing Baburao shows us his looms, spindles, spinning wheels and a carding machine. Mentoring a group of 14-16 weavers at a time, churning one and a half sari per day per weaver, his workshop was also a school in running. Weavers from Mangalore were popularly called for their deft capacity of two sarees a day and carpenters to fashion their looms were also invariably from the city. Harishchandra, a local carpenter was an exception to the happy go lucky Govan population. Each order was made to custom. 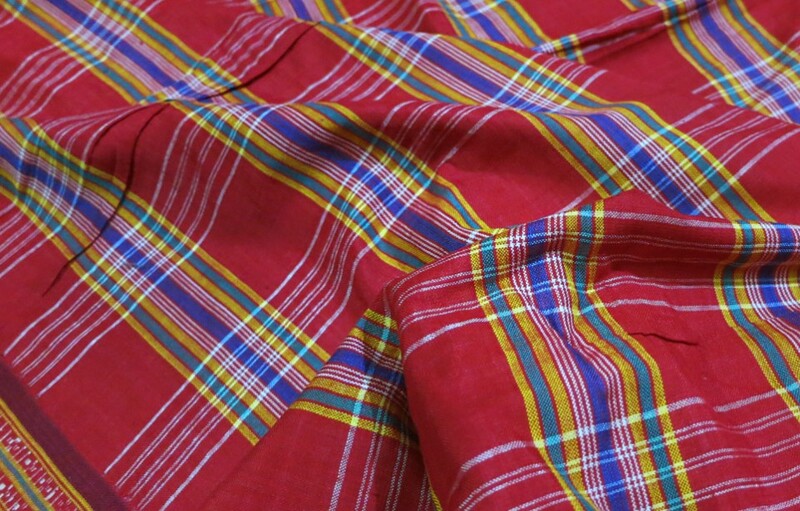 Catering to various stages in life and occasions, they made Kunbi saris in their trademark checkered patterns in Yellow (Kesara), Red (Tamodh), Green (Hirva), darker shades of Maroon, Purple and Black signifying Youth, Marriage, Old age and Death. 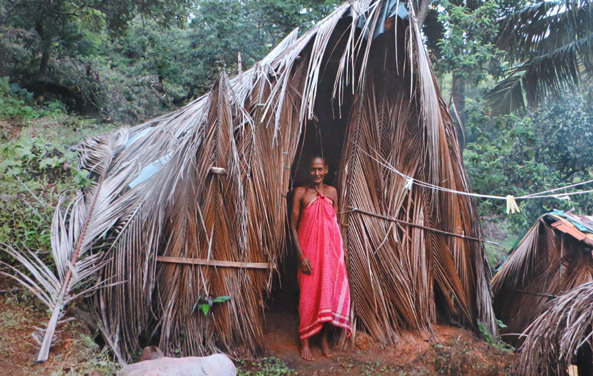 Men wore a red and white loin cloth called Kastti around their waist and climbed tall coconut trees and women these saris typically draped and held with a knot in front of their shoulder, with or without a blouse. They were also made to signify different sects within the community. While their color pallet was small and standard, the lengths and their widths were made as per the person. The popular Maharashtrian Nauvaari being a nine yard sari, usually optimum for most of the population, one could also see Dahvaaris and Chavaaris… Variants in smaller widths for shorter people were also made. 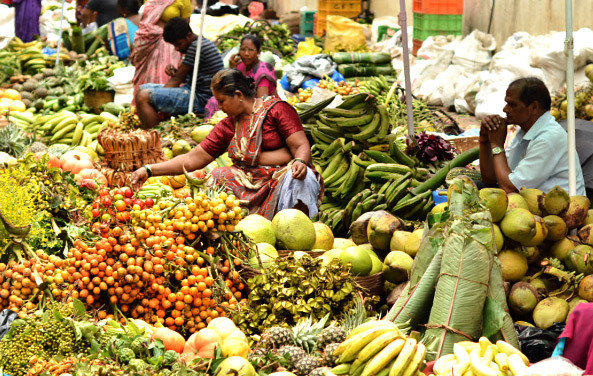 Women dressed up in new saris… flower Venis decorating their mane and scenting their clean, oiled buns, bindi or a tilak on their foreheads and ears dazzling with gold rings and studs…. Their stature strong and well built. 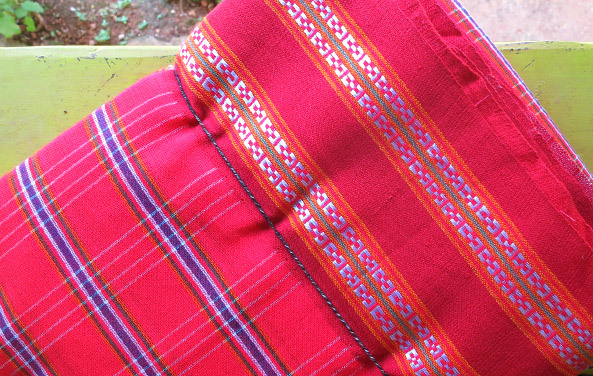 School going girls wore skirts and boys a loin cloth of the same woven checkered fabric (kapot). 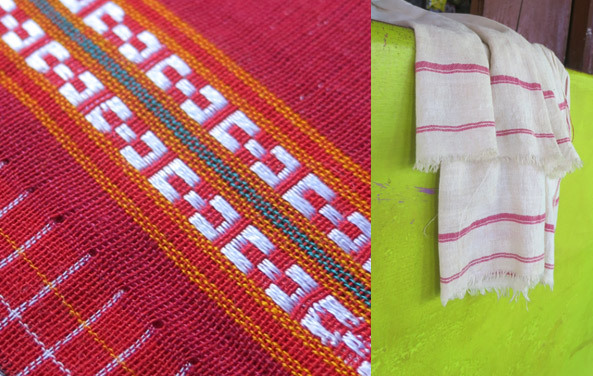 Apart from these, valo (small towel), tuvalo (towel), chador (bed sheet), and the traditional Gaudda sari was also seen taking birth on the looms. The yarn for weaving was usually collected either from the shop owner in the city who would receive the woven fabric in return or from yarn merchants popularly known as Mambrey. 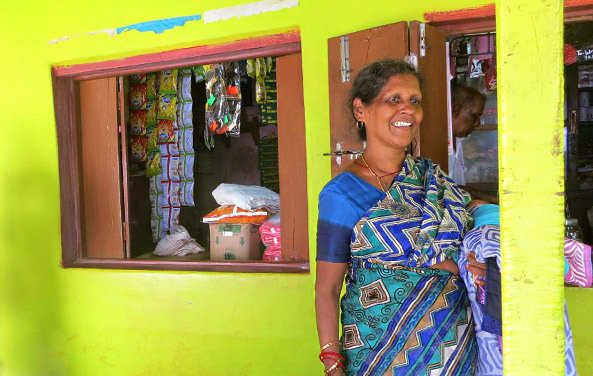 There were families of dyers like the Shetty home in Belgaum who would dye the yarn if it was in huge quantities. Small quantities were dyed or bleached in the household by the weaver only. The village is placed between the borders of Maharashtra and Goa in a geographic location which is blessed with floral diversity. With about 156 dye yielding plants surrounding them, collecting natural dyes was a matter of looking around and identifying these plants. These dyes are developed today by the Sawantwadi, Maharashtra based BioDye India Pvt. Ltd, a set up run by Dr. Bosco Henriques that deals in natural dyes. However, Kunbis were mostly dyed in naphtha colors. Single yarn per dent of shuttle on a simple pit loom was woven. Fabric from as rough as 20s count to 40s to 60s was woven as per the demand and was sold in Mapsa and Margaon markets. Traditionally, the Kunbi is a cotton chequered sari in red and white with a sturdy weave good enough to be worn for farming. A dobby border, which is essentially a silken flat inset in the original Kunbi can be found. It is worn short above ankles with a knot on the shoulder. 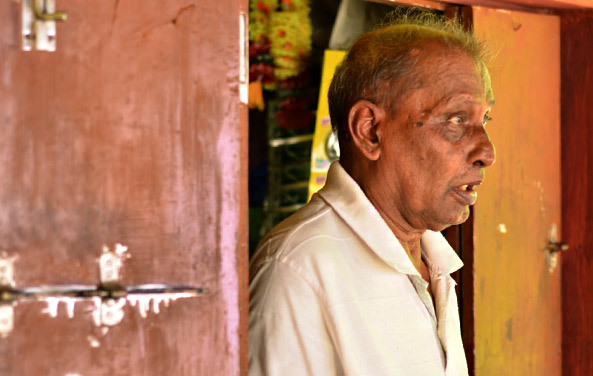 “One sari in 1960-70 would cost somewhere between Rs40 – Rs70 and a silk one would not be more than Rs200” recalls Ranganath Kamath, another master of the craft from Candolim. The required loom accessories like heald frames, shuttle, heald wires, binding thread, warping machine, creel and yarn was purchased from Belgaum , Gadag and Hubli. The operation of sizing the yarn constituted one of the most important stages in the preparation of warps which if not previously sized, would be unable to withstand the tensile strain and excessive chaﬁng action of the shedding harness, reed, and shuttle race-board during the operation of weaving. The natural sizing material which used was odorless, inexpensive and locally available; it was fine wheat flour or Maida. 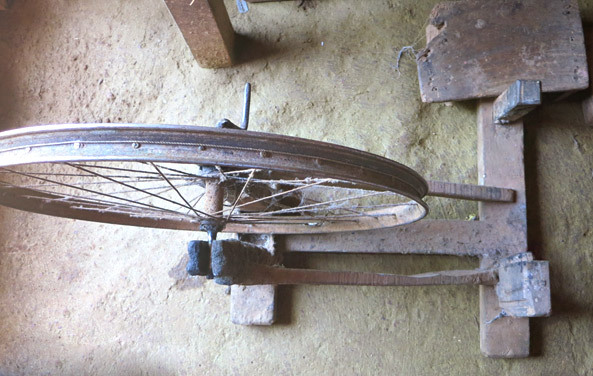 Bobbin winding was carried out by using Charakha called bobbin winder. 312-320 bobbins were required for preparation of each warp beam to weave sarees. Individual yarns from each bobbin passed through reed and were then wound on warp beam. The reed being a guide to check the broken yarns. Approximately 14 meter of yarn would be wound in 8 different sections to make the required width of the sari body. Till about thirty years ago there were many families in Bastora village involved in the practice. Kunbi weaving saw a downfall during the time government power loom units were set up in surrounding villages in 1970s. The fabric was cheaper and produced faster than the weavers ever could produce. Despite this low demand some continued weaving for it was difficult to part from what they had been practicing since their childhood and this was the only means of earning livelihood respectably they could see…. Hunting for yarn and weaving to sustain and supply merely to their neighbors. This, from the times his fabric was much in demand and he was a celebrity has hampered his generosity little. He is still hospitable and has something to offer to everyone. Honest to his craft he only takes what he feels is the right price for his fabric, not a penny extra. 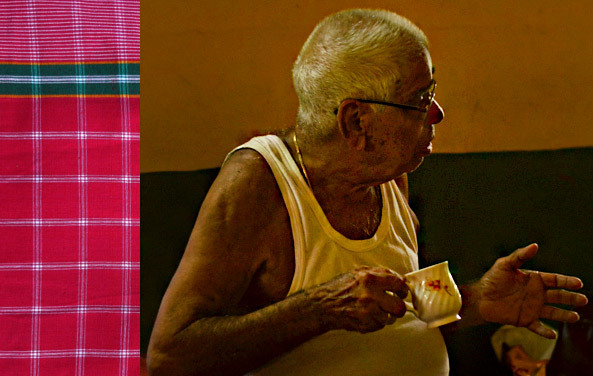 And as he gets busy talking about their rituals and festivals Ganesh Chaturthi, Diwali, Navratri, their favorite sweets Chakli and karanji… a distant voice breaks the nostalgia. It is the carpet seller selling homemade Godadhis along with plastic woven mats. It is rare to see them with a seller because they are usually made in the village by women for their own household… from the left over of weaving or old rags. And a bunch of school children come flocking by dressed neatly in their uniforms… red and white checkered shirts and skirts… and one leaps for a closer look…. Only to find out that it is a print of kunbi patterns on mill made fabric…. A take on from our heritage… is it? Myself from handloom sector of Odisha state .rich in handloom will visit utrakhand on exposure visit with weavers.can I have any officers name from Iiht Varanasi . thanks for going there and bringing this lesser known craft to all of us…. thanks for going there and bringing this to our notice. Hope to see some Kunbi Sarees in your future post very soon.